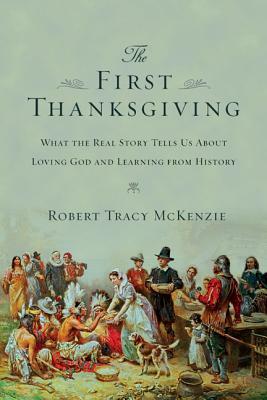 Robert Tracy McKenzie, Chair of the History Department at Wheaton College (IL), recently released a book entitled The First Thanksgiving: What the Real Story Tells Us About Loving God and Learning from History. This is obviously a timely book as we lean into the celebration of Thanksgiving this week. With all the debates about the faith of our country’s founders, McKenzie gets us into a helpful exploration of the motivations and context of the original pilgrims’ journey across the Atlantic. In telling this story, McKenzie clears up a host of misconceptions about the Plymouth settlers, who certainly did not wear buckled hats or black clothes (those were a 19th-century sartorial invention). He demonstrates that the quest for “religious freedom,” in the modern sense, did not really animate the Pilgrims. Yes, they wanted to find a place where they could worship God according to Scripture and the dictates of conscience. But they had already discovered those conditions in Holland, where a number of English dissenters had gone in the early 1600s. The most pressing concern that led the Plymouth Separatists to leave Holland was that they found the Netherlands “a hard place to maintain their English identity and an even harder place to make a living.” They did not worry so much about religious persecution (at least not since they left England), but about “spiritual danger and decline.” They worried about the cultural corruption they saw around them in foreign Dutch culture, and struggled to find profitable employment that could nourish their common identity. America seemed to offer both better opportunity and a place to preserve their sense of covenanted community. McKenzie’s focus here is not so much how America was founded as a refuge for religious freedom. The real lesson has to do with maintaining Christian commitment in the midst of a worldly, permissive culture. “The Pilgrims grappled with fundamental questions still relevant to us today: What is the true cost of discipleship? What must we sacrifice in pursuit of the kingdom?” To what lengths should we go—how far should we go—to maintain a proper separation from the world? The Pilgrims decided they should traverse the dangerous Atlantic to do so, yet they found that the New World had many of the same challenges as the Old, plus some new ones, such as relating to Native American neighbors.